In the garage today, we have one of the great GM products of the late 2000s. The Cobalt SS is an amazing little rocket that we will do a full road test on very soon. Today though, we are installing ZZP's Billet Engine Mount. This little gem of a part will work with any Chevrolet Cobalt or Saturn Ion running the 2.0L or 2.4L engine, and only a manual transmission. We are working on a 2009 SS sedan, with the turbocharged engine. 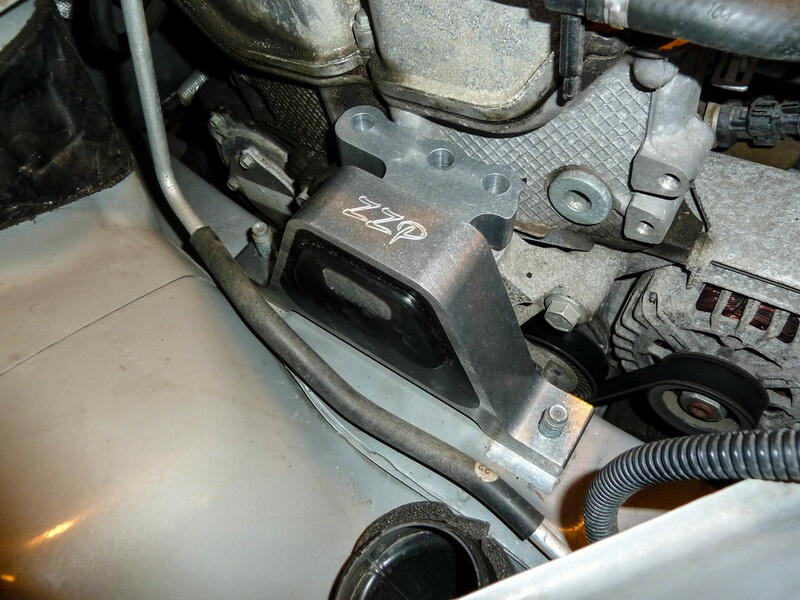 Some of the stated features from ZZP include an all aluminum construction that sheds a pound and also a poly center that eliminates engine movement. For this review, we are going to go through the install and our impressions on what we have found. From the get go, this was an interesting installation because ZZP included no instructions. So basically we relied on our instincts and also a little googling. 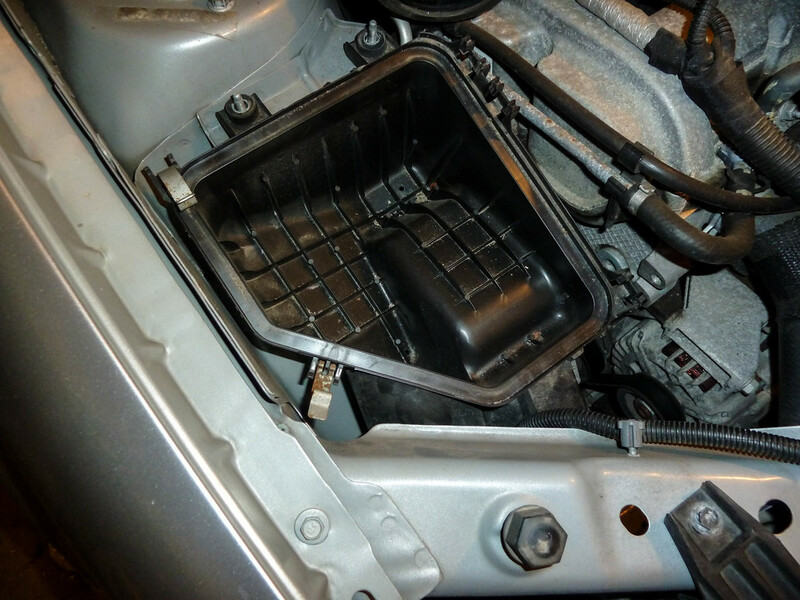 To start, we removed the stock air box lid by undoing the clips. 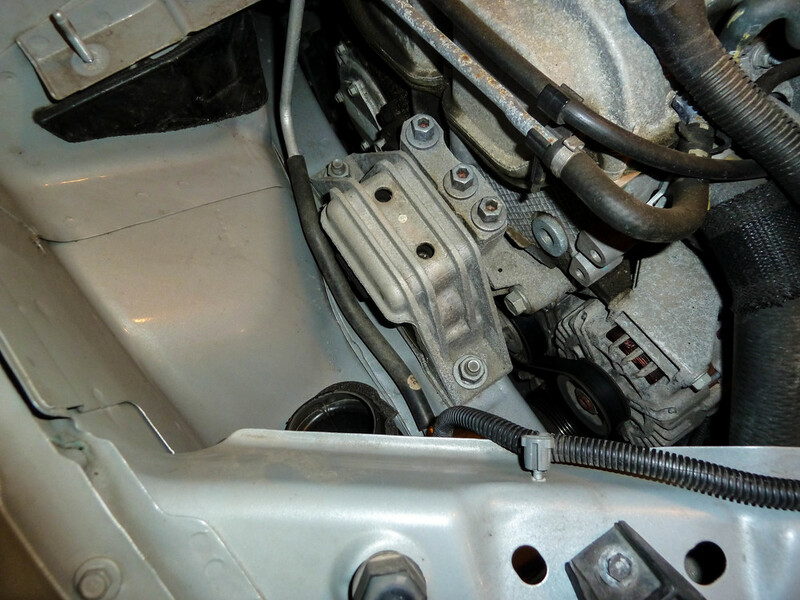 The connector can stay on, as it will give you enough slack just to lay the top air box on your engine. Next up are the top nuts and the tiny torx bit down towards the front of the vehicle. 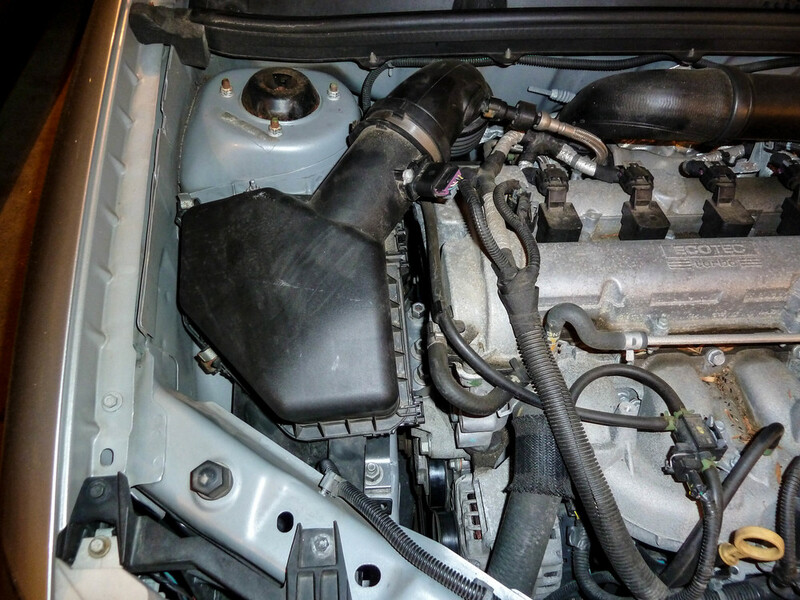 Once you do this, the stock engine mount is revealed. The engine has to be slightly supported for this mod, so a low profile jack with a small block of wood is placed under the oil pan. Give your jack one or two pumps, just to slightly hold the engine up. This is the fun part. Admire your new part next to the old stocker and see where your cash has gone. The ZZP mount is much simpler, sturdier, and looks better too. You can see the differences for yourself. Installation of your new mount is basically the same as disassembly, but in reverse order. Go ahead and fit your new mount to the studs on the frame. We opted to start the long bolts into the engine first, as those seemed to have the least amount of play involved. Once those three were started, we caught the 18mm nuts. The frame nuts need to be torqued down first. Move onto the engine bolts, tightening the middle one first. This will pull the engine up to the ZZP Mount nice and straight. We didn't fully wrench this down yet, just snug. Then move to the back one, snug it, then make the front one snug. We did final tightening on them all, alternating and slowly torquing them as to pull it all up evenly. There is a torque setting I'm sure for these, but I just basically used the same amount the factory bolts had, maybe a tick more, nothing crazy though. After that, lower your jack, reinstall the air box and you should be good to do. The mount does transmit a little bit of vibration into the cabin. To us, it almost sounded exhaust like, as you were feeling and hearing the vibrations. Overall though, it is definitely liveable for a daily driver and nothing too crazy. You will notice a difference for sure though. We didn't get into any hard launches or attempt to beat on the car, but you do get the sense that the engine feels tighter at higher revs and through the power band. To get an idea of what we mean, you would really have to drive one of these before and after installation for comparison purposes. Some people worry that this type of mod might ruin this car. This is not one of those modifications, as you will enjoy your car a little more and sacrifice just a tiny bit of comfort in the process. Next on the list from ZZP is a set of rotated front/rear transmission mounts. We will do the same thing, documenting the procedure for installation and also our impressions. 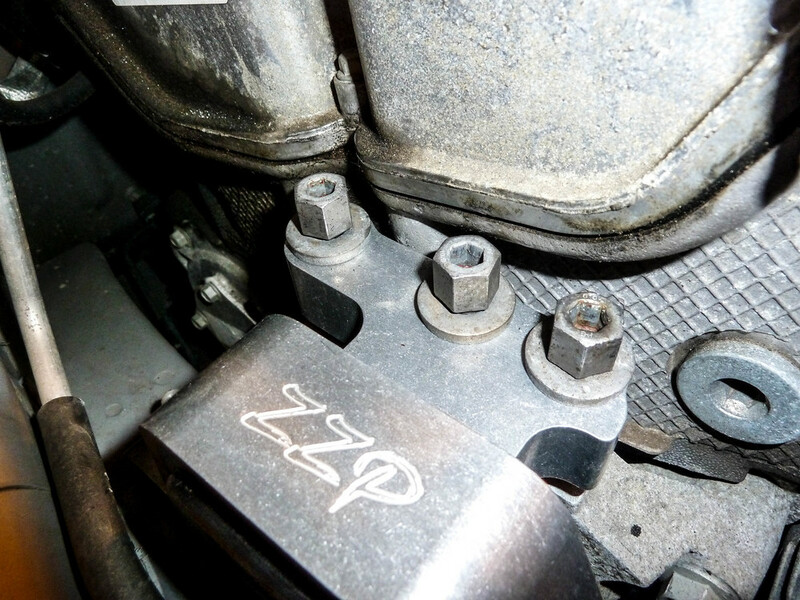 FYI- The top three engine mount bolts are very close to the engine. 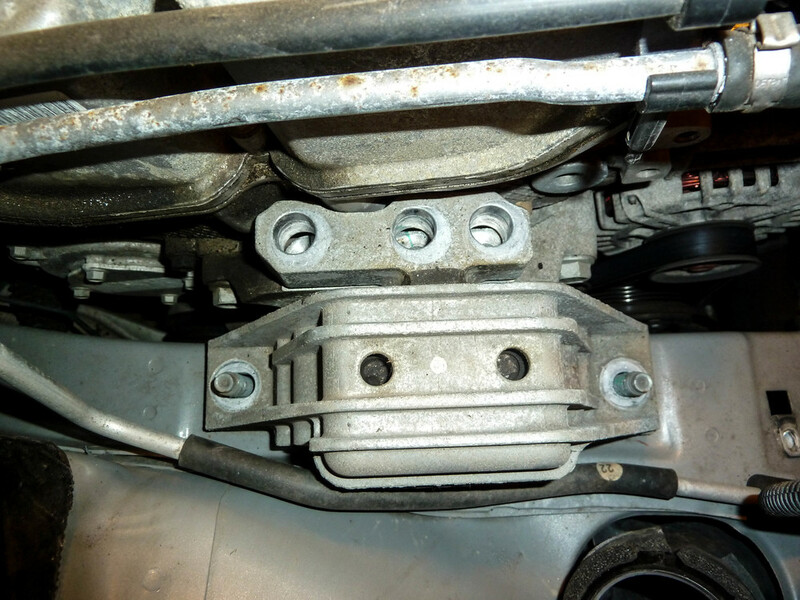 With that being said, if your vehicle was involved in a passenger side impact or something along those lines, it could feasibly throw off your mount alignment and make those bolts difficult to install. Just something we noticed during our installation.